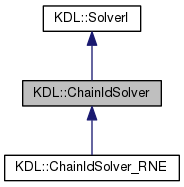 This abstract class encapsulates the inverse dynamics solver for a KDL::Chain. Definition at line 40 of file chainidsolver.hpp. Calculate inverse dynamics, from joint positions, velocity, acceleration, external forces to joint torques/forces.